Pope Annalisa, book one of The First Souls Trilogy, is a sweeping epic of the evolving human soul. It is a rare work, part thriller, part spiritual wisdom text that opens the reader’s eyes to a new paradigm of reality grounded in genuine ancient mystery teachings and modern sciences such as quantum physics. Like many works that are bold and original, people often make assumptions about Pope Annalisa based on the title, the book cover, or their personal feelings about religion/spirituality. For this reason it helps to understand what the book is and what it is not. It is not a “religious book” but a book about a universal spirituality that transcends religious divides. It is not a “Catholic book” but a book that uses the Catholic Church as a vehicle to tell a universal story about the deep mysteries of our existence. It is not an “occult book” but a book that touches on the real basis for the miraculous in our lives. It is not a portrayal of evil in sensationalist “Hollywood pulp” style but it illuminates the relation between good and evil in a profound manner based on philosophical and scriptural history. It is not a Da Vinci Code “knock off” but a deeper treatment of ancient secrets using genuine, recovered Judeo-Christian gospels and paralleling them with discoveries in modern science to present a startling view of the material creation. Annalisa Basanjo is an African nun who performs miraculous healings in the back country of Nigeria, a warzone between Christianity and Islam. Her world of 2025 is bleak. Nations border on war over religious differences and dwindling resources. A body of prophecy within the Catholic Church speaks of a mysterious Great Heretic who will arise within the the Church destroying it and leading the world order to ruin. At first under investigation over the source of her healing abilities, she rise to the papacy through a series of extraordinary circumstances the reader will find completely believable. But Pope Annalisa has many enemies within and outside of the Church. When mysterious, even demonic-looking symbols begin appearing around the Vatican upon her arrival, it seems her adversaries may have been correct about her being the prophesied figure. Is Annalisa, the first female pope, restoring the lost feminine legacy of Christianity or is she using her disarming femininity to resurrect the most dreaded heresy the Church ever faced? Is she truly reviving the secret knowledge Jesus taught that unleashed a torrent of miracles in biblical days, a transformative teaching so powerful that it had to be suppressed by the early Church, or is she concealing some hidden agenda? One thing becomes clear—Pope Annalisa is at the very center of all the deadly plots within plots in a world where nothing is as it seems. Four people must race against time to learn the shocking secret of the first female pope. 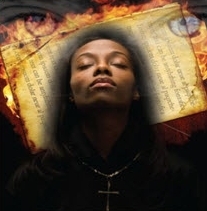 As the world nears nuclear holocaust, as sinister hidden forces from within her own church and terrorism from without rear their heads, the quest of these people will not only uncover the shocking truth about Annalisa, but about themselves, and in doing so they will touch upon the very origin and destiny of humanity. And though it was a miracle for a woman to become pope, it will be a far greater miracle if she survives. Pope Annalisa is about hope, reconciliation, evolution, balancing the forces of creation, and the ability to connect with a higher dimension lying within all of us. Live with the fascinating characters of Pope Annalisa as they face numerous dangers in unraveling the real, monumental mysteries of history that lie at the very foundation of our Western world. The ultimate prize may be the unlocking of a higher consciousness and a new view of reality that could redirect our evolution to save us from the errors of our past and the potential destruction of our future. Please enjoy navigating the site below. The topics describe the tributary streams that flowed into the making of this extraordinary saga. THE FIRST SOULS TRILOGY THE FIRST SOULS — Information on the epic trilogy about the Fall of spirit and the creation of the material world. Learn how seemingly ordinary people must grow from extraordinary circumstances not just to save the earth from destruction, but to save the collective soul of humanity by discovering the secret of our origin and destiny. POPE ANNALISA FAQ POPE ANNALISA FAQ — Answers important questions about The First Souls and Pope Annalisa, the first book of the trilogy. GNOSTICISM GNOSTICISM — Did you know there was an enormously influential sect of mystical Christians whose beliefs and practices tied them to Kabbalistic Judaism, Hindusim, Buddhism, and the pagan Western mystery rites? Learn the startling facts about Gnostic Christianity, why it could never be stamped out by the Church, and how its mystic visions discerned things that science, psychology, and religion are just beginning to rediscover today. MYTH & REALITY MYTH & REALITY — A fascinating exploration of the blurred frontiers between myth and reality, between science and mysticism. Reveals astounding findings on the nature of our apparent reality from quantum physics. Explores the basis for miraculous healings from molecular biology and epigenetics. See the rediscovery of things ancient spirituality was saying two thousand years ago by the depth psychology of Karl Jung. Draws correlations between ancient wisdom and modern science that are the basis for many themes in The First Souls trilogy. MARY MAGDALENE MARY MAGDALENE — Noticed the upsurge of interest in this mysterious biblical figure? She plays a prominent role in The First Souls trilogy. Find out what is really behind the rediscovery of Magdalene and what her story symbolizes for all of us. TRIMOUNTAINE PUBLISHING TRIMOUNTAINE PUBLISHING — To make available to the public quality, non-conventional works of creative fiction that explore the lost, forgotten, or repressed mystical aspects of modern and ancient religious traditions. LINKS LINKS— Links to a valuable online library of websites for those wanting further readings on the topic presented in this site.